New Blog Dropping By Afronerd Radio's Daryll B.! 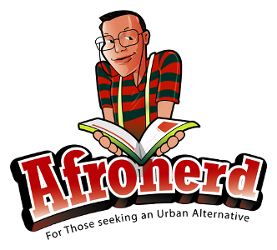 Sports Geekery Included-Pt 1 & 2 - Afronerd: The Blerd Revolution Has Begun! Had an article 50% done before I passed out. Woke up about 90 minutes before I had to work so I decided to let article lie until I got home. So of course what happens? I have to tweak my sports part of this blog MAJORLY now!!! Way to upset the great Futbol tidings of the nation US Men! What kind of way to start a match vs Jamaica was that? All the congrats in the world to the Reggae Boyz who fought hard from the opening whistle and deserved the 2-1 win. When will the Americans play a game strong from start to finish? Even though my team of heritage, Trinidad and Tobago, were ousted in the quarters on penalties by Panama, I am still proud of the Soca Warriors. Great showing! Kyle Busch REALLY trying to prove wins cover up all. He has won 3 out of the last 4 races and is up to 33rd in the standings. Consistent finishes in the Top 15-20 over the next 7 races will get him in the Chase for sure. I been loving this Summer of Yankees Renaissance that has been happening. Lord knows I didn't see this before the season started. I look away to concentrate on Futbol for a few weeks and BOOM! Albert Pujols gets hot and now the Angels are ahead of the Astros by 2 games. Maybe I was wrong about that coach/GM thing. Because since the GM left, Los Angeles has been red hot! Really did not see FC Dallas' youth gelling so well so early but they are on top of the West. We'll get a sense of how good they actually are over the next 5 games as they have Portland, LA, and Real Salt Lake visiting and have to go to Chicago and Vancouver. As much moaning as I do over my RedBulls erratic play to start the Summer, we had a 4-2 win over Chelsea Wednesday Night!!! Wait a sec.... Mind you this comes 28 hours after a heartbreaking US Open Cup loss on penalties in Philly. The senior team may give me ulcers but I am loving the talented kids on the Academy team. This win was because of their heart! Can we all now call this Brady Investigation a joke now? Justin Gatlin has learned nothing. If Usain Bolt is hurt, and with all your yapping, you BETTER win gold at the World Championships now. Captain Marvel and the Carol Corps #2 by Kelly Sue DeConnick & Kelly Thompson with art by David Lopez - Ask too many questions and a house built of cards will collapse on itself. That's what the Corps find out here as EVERYTHING they even have known has clashed in chaotic fashion. What is it about the most loyal that makes them your worst enemies when disillusioned? Captain Britain and the Mighty Defenders #1 by Al Ewing with art by Alan Davis - Speaking of disillusioned, wow we find out the bitter price for questioning Lord Doom Thy God here as the heroes of Yinsen City get a reality check in the worst way imaginable. Folks who are fans of Captain America and the Mighty Avengers, just keep track of this book as Ewing works his magic and Davis gets to draw some of Britain's finest heroes (and a thinly veiled anti-hero to boot!). Also I want a Thor Gavel! I couldn't lift Thor's Hammer but I'd love a shot at that one! The Book of Death #1 by Robert Venditti with art by Robert Gill and Doug Braithwaite - Thank you Venditti for giving me nightmares and absolutely guaranteeing that I won't set foot in Ashlee, Wyoming. EVER! Now if that visual horror was in The Happening, I would have a better opinion of the movie. This follow up event to The Valiant already has me having to read the book with ALL the lights on, just in case any bugs want to sneak up on me.... DON'T ASK!!! Like I said, this is part one for the week. Part Two: I get into the hip hop cover controversy; I do my shrinking review of Ant-Man; Album reviews on 12 Reasons To Die II by Ghostface and Adrian Younge and Two Weeks Notice by Mikal kHill and Tribe-One; Finally I have psuedo reviews/exclamations for more books including Cyborg, A-Force, Astro City, and Marvel Zombies. I must go unconscious now. Thx for reading. Until Next Time Readers, I See You in the Stands, Fantasizing! Two Weeks Notice by Mikal kHill and Tribe-One - One of the things that anyone that truly knows me can tell you is that I listen to just about everything. If an artist does right by me, I'll continue to follow them until they stop making music. That being the case, Mikal and Tribe announced 3 weeks ago that they would be making an album AND briefly touring... all on, you got it, 2 weeks notice. Even for NerdCore artists, this is quite the undertaking but they TOTALLY pull this off. 10 tracks. First part, self-boasting; Second part, self loathing but around the third stage we get into a weird hip-hop-mythical vibe (a theme I'll touch on the next album also!) that makes the project pop! Simple yet catchy beats along with intricate lyrical wordplay makes this experiment a must listen for hip-hop heads. 12 Reasons To Die II by Ghostface Killah and Adrian Younge - Unlike what some might think or say, Ghostface has lost nothing on his fastball. He can lyrically hold his own with most rappers. Curiously, his Tonk Starks persona has taken a quite dark/demonic turn with these 12 Reasons albums. Lies, betrayal, revenge, liven up DEMONIC BARGAINS and force me now to actually find a category for this album. I can't use HorrorCore...at least I don't think I can. I think that is still tied to metal... Anyway, those hip-hop fans who like their street raps extremely dark will love this album. I don't know offhand if this album will have a comic adaptation like the first but whoa. Just whoa. It feeds into the parts of you that crave the darkness and gives into primal emotion. Of course, he has frequent collaborator Raekwon join him here but drama lovers may be disappointed to know that RZA has a strong presence on the record also. Is it his best undertaking? Nope. But Ghostface is still quality folks and the Cain/Ghostface/Tony Starks legacy is a quite twisted one indeed. 2) My thanks to Joseph Illidge and David Brothers who highlighted that while the covers are dope, they are largely all being done sans black artists and that led to a further examination (again) of the Marvel lineup of writers and artists for post Secret Wars and found it majorly lacking color. Sorry House of Ideas. No protection or excuses for this one, especially when DC has started to make strides again in that part of diversity AND we black fans can see other companies employing more and more minority talents. I really liked Ant-Man even with the flaws. To me, this could be for the next phase what Iron Man was to the first. Paul Rudd is great as hard luck (ex-)criminal turned hero Scott Lang. Rudd captured Lang's torment between doing right by his daughter and always ending up doing the wrong thing well. He and Michael Douglas as Hank Pym had a great teacher/student dynamic. Evangeline Lilly was good as Hope Van Dyne. Michael Pena steals every scene he's in as Scott Lang's sidekick Luis. Rapid fire jokes, deadpan comedy, and his charm help to paint over some of the failings of the movie. However, this was a good movie and I definitely give it my support. Greg Pak. Asian-American Cowboy. Magic. Bonus Adam WarRock theme song! Bag of Tricks Cat ft Mega Ran and Brandon Michael "Dream Girl"
Years of Future Past #3 by Marguerite Bennett with art by Mike Norton - A Bennett two-fer as she delves into another dystopian future featuring everyone's favorite mutants. Heck, the series won me over last issue with a kaiju sized Lockheed. Yes. I did actually say that X-Men Fans. And I will always love a kick-a$$ Storm in ANY era. Astro City #25 by Kurt Busiek with art by Jesus Merino (interiors) and Alex Ross (cover) - Who knew a character named Hummingbird could have such a rich history. Yet be so detailed within a single issue. Gods, teen problems, legacy, and curses abound here folks! Thx For Reading! Until Next Time, Keep Fantasizing!